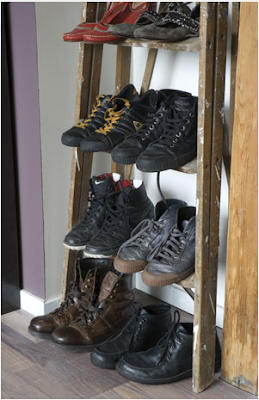 Ashbee Design: Ladders and Shoes! Of Course! Part 6 of the Ladders Series - Links to all posts below. A fashionista I am not! But I do appreciate how beautiful a collection of shoes can be so why hide them. 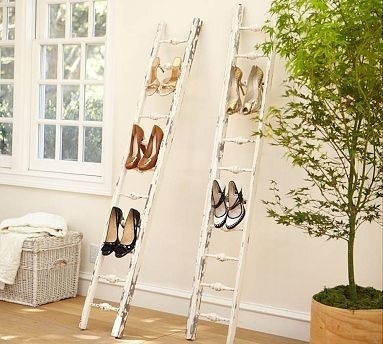 Use a vintage ladder and display them! Great bedroom décor and it helps with limited closet space. This approach doesn't require vintage or even country. The next photo is decidedly modern and contemporary. Or even to shoes! 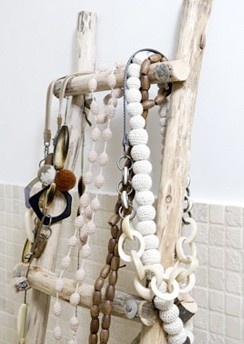 How about using a ladder for storing jewelry? 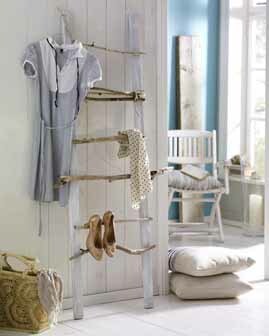 An additional idea is to use a ladder as a display space as you plan your wardrobe. Getting up in the morning would be so much easier if there, beautifully displayed on the ladder, was the outfit for the day.